I’ve taken plenty of grief for this on FB, but this Duke grad and NC State employee/fan, could not resist the opportunity to pose with UNC mascot Ramses at a NCSU-UNC soccer game last night. More than anything, as my social media feed will attest, I am a sucker for mascots. 1) I’m loving all the Wirecutter stories in my FB feed these days. I’m especially intrigued by the idea of a carry-on carry-on bag. It’s possible I’m not the right person to offer the following analysis. Yet it’s also a good rule to seek wisdom wherever it may be found. So here’s what I have to offer from the right, amid the storms of the Trump era. The more conservative protests are, the more radical they are. You want to scare Trump? Be orderly, polite, and visibly patriotic. Trump wants to identify all opposition to him with the black-masked crowbar thugs who smashed windows and burned a limo on his inauguration day. Remember Trump’s tweet about stripping citizenship from flag burners? It’s beyond audacious that a candidate who publicly requested help from Russian espionage services against his opponent would claim the flag as his own. But Trump is trying. Don’t let him get away with it. Carry the flag. Open with the Pledge of Allegiance. Close by singing the Star Spangled Banner––like these protesters at LAX, in video posted by The Atlantic’s own Conor Friedersdorf. Trump’s presidency is itself one long flag-burning, an attack on the principles and institutions of the American republic. That republic’s symbols are your symbols. You should cherish them and brandish them. 3) Stan Greenberg’s take on why Clinton lost. 6) Eric Reid’s NYT Op-Ed on why he kneels is awesome and eloquent. Puts the haters to shame. 8) Literally the one non-dessert food all the Greene’s will eat? Pancakes. The science behind what makes them so good. 10) Every single cognitive bias in one infographic. 11) Didn’t realize that so many website started pushing video as a way to increase ad revenue. That said, I’m surprised that this CJR story did not mention that for your typical informative story, video is just a way, way less efficient way to consume information. 13) Tom Price is just an amazing sleazeball. Good riddance! Nice NYT editorial on what he represents in Trump’s view of public service. 14) James Hamblin of ongoing Republican efforts to sabotage ACA. The NCAA could act as The Masters and Augusta National Golf Club if it wished. The Masters does not allow commercialization of its product beyond its comfort level and has rules for its media partners. Augusta National could make far more money off that property if it wished, but it finds other things more important. Not the NCAA. If your decisions reveal your priorities, the NCAA’s first priority is money. 16) A remarkably candid admission from a Freedom Caucus stalwart that deficits only matter when Democrats are president. 17) The latest research finds that “broken windows” policing may actually lead to more crime. Here’s another dirty secret: Earmarks don’t actually cost anything. Overall spending levels are set by Congress in appropriations bills, and bureau­cratic formulas decide how much money goes to each state. Earmarks merely redirect some of that spending; they don’t add to it. 19) Latest thorough research suggests that campaigning of all sorts has virtually no impact in persuading voters of whom to vote for. 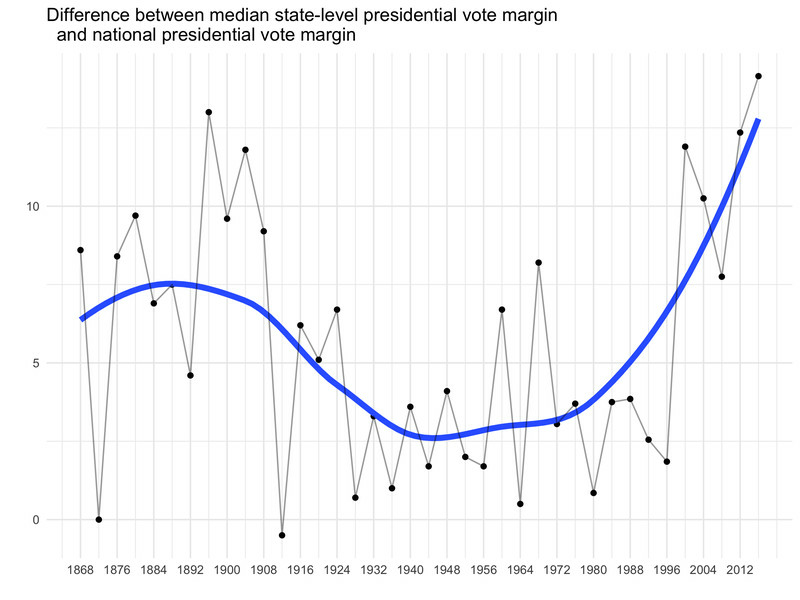 That said, there still is evidence for its effects on turnout. (That said, let’s not ignore selection bias in these statistics). 21) Peter Beinart on how Republicans are not apparently totally okay with Roy Moore’s blatant anti-Muslim prejudice. Moore has openly defied legal authority in service of his belief that his theology overrides the authority of the United States government. This ought to disqualify Moore for service in public office, the most minimal qualification for which is a profession of respect for the rule of law. And yet, rather than declaring Moore unfit to serve, Republicans have endorsed his candidacy. Their stated qualms are limited to the concern that he might fail to vote for their tax-cut plan. 23) Interesting feature on how Darrell Hammond lost his SNL Trump impression to Alec Baldwin. Dahlia Lithwick shared this on FB. Love it. Empathy. Listening. Changing one’s mind. Humility. Personal Relationships. Rinse Repeat. Aug 14, 2016- Colin Kaepernick sits for the national anthem…..and no one noticed. Aug 20th, 2016- Colin again sits, and again, no one noticed. Aug 26th, 2016- Colin sits and this time he is met with a level of vitriol unseen against an athlete. Even the future President of the United States took shots at him while on the campaign trail. Colin went on to explain his protest had NOTHING to with the military, but he felt it hard to stand for a flag that didn’t treat people of color fairly. Then on on Aug 30th, 2016 Nate Boyer, a former Army Green Beret turned NFL long snapper, penned an open letter to Colin in the Army Times. In it he expressed how Colin’s sitting affected him. “I’m not judging you for standing up for what you believe in. It’s your inalienable right. What you are doing takes a lot of courage, and I’d be lying if I said I knew what it was like to walk around in your shoes. I’ve never had to deal with prejudice because of the color of my skin, and for me to say I can relate to what you’ve gone through is as ignorant as someone who’s never been in a combat zone telling me they understand what it’s like to go to war. Mr. Boyer goes on to write “There are already plenty people fighting fire with fire, and it’s just not helping anyone or anything. So I’m just going to keep listening, with an open mind. Empathy and understanding was shown by Mr. Boyer………and Mr. Kaepernick reciprocated. Colin invited Nate to San Diego where the two had a 90 minute discussion and Nate proposed Colin kneel instead of sit. But why kneel? In a military funeral, after the flag is taken off the casket of the fallen military member, it is smartly folded 13 times and then presented to the parents, spouse or child of the fallen member by a fellow service member while KNEELING. The two decided that kneeling for the flag would symbolize his reverence for those that paid the ultimate sacrifice while still allowing Colin to peacefully protest the injustices he saw. Empathy, not zealotry under the guise of patriotism, is the only way meaningful discussion can be had. Mr. Kaepernick listened to all of you that say he disrespects the military and extended an olive branch to find peace. It’s hard to predict the economic impact of these skeletal proposals. But most experts agree that they could raise the federal budget deficit by trillions of dollars. As they have so many times in the past, Republicans will surely argue that the cuts would spur growth, and, in some measure, pay for themselves. This is the old supply-side hooey. In fact, over time the increased borrowing for unproductive tax cuts could depress growth by driving up interest rates. It should also be noted that none of this is real reform. This is just tax cuts for rich people with a few tweaks. We could use real reform, bu this sure as hell ain’t it. That the display evokes so much fury and disgust among whites, from the president on down, confirms what was evident 50 years ago. The problem is not how blacks raise their complaints about American society; it’s that they raise them. When LeBron James and other NBA players wore shirts that said “I can’t breathe” to protest police killings of unarmed black men, Commissioner Adam Silver expressed his disapproval, and Fox News commentator Geraldo Rivera slammed James. When several St. Louis Rams came out for a game with their hands raised to protest the killing of Michael Brown, the local police union demanded they be punished. Are there better ways for them to make their point? Maybe so. But it wouldn’t make much difference. To many whites, the only good black protest is no black protest. Yep. No matter what so many of the critics say (disrespecting the anthem, the military, etc.,; there should be other forms of more appropriate protest; how dare rich Black athletes protest), when you get down to it, sadly, for many white people it is a matter of how dare Blacks protest for their rights. Ugh. Before Trump, there was enough overlap between popular will and electoral outcome to make the issue largely semantic. Now it’s existential. Certainly, we need checks on the tyranny of the majority. But what we have now is the tyranny of the minority. Not that there’s much hope for them in the short-medium future, but I appreciate Goldberg advocating the National Popular Vote plan from Fairvote. At some point, a body where 20% of the citizens have 80% of the representation brings the very legitimacy of that body into question. And, there is no more important body when it comes to policy in the US than the Senate. Just ask yourself what you would think of an institution like that in another democracy. You’d probably wonder if it were really a democracy. Yeah, it is extra frustrating that this dramatically benefits the Republican party. But, historically speaking, I’m pretty sure land has always been more conservative than humans (because city dwellers are always more liberal than rural dwellers). So, time to stop having so much of what happens in this country determined by acreage. Yet the belief endures, from Armstrong’s time and before, that visible, affluent African-Americans entertainers are obliged to adopt a pose of ceaseless gratitude—appreciation for the waiver that spared them the low status of so many others of their kind. Stevie Wonder began a performance in Central Park last night by taking a knee, prompting Congressman Joe Walsh to tweet that Wonder was “another ungrateful black multi-millionaire.” Ungrateful is the new uppity. Trump’s supporters, by a twenty-four-point margin, agree with the idea that most Americans have not got as much as they deserve—though they overwhelmingly withhold the right to that sentiment from African-Americans. Thus, the wonder is not the unhinged behavior of this weekend but rather that it took Trump so long to exploit a target as rich in potential racial resentment as wealthy black athletes who have the temerity to believe in the First Amendment. Damn that’s good. Read all of it. Also, a few of my favorite tweets on the misappropriation of the national anthem, etc. It does not represent our “military and first responders.” It represents the American people. And the American people are failing on issues of racial justice (exhibit A: we elected Donald Trump). We can respect/honor our military while also realizing that the use of military sacrifice as a totem to squelch dissent is wrong/fascistic. If a knee in Freddy Gray's back upset you as much a knee on the ground, this would be over. Also, the anthem is not metaphor for military. Flag is not metaphor for military. Military is not most important part of US.